Almost a year or so ago I made my Table Top Review Video for both the 6mm Airsoft and 4.5mm Steel BB shooting KWC Mac 11 M11 CO2 Pistols, and no they are not machine pistols since they only shoot in semi auto mode. Well anyway, I finally got around to testing these low cost Mac 11 replicas out shooting them through my Chrony Chronograph to find out their real world fps velocity along with my standard 30 foot back semi rested paper target accuracy test. Both CO2 Replica Pistols performed rather well for me and turned out to be both powerful and accurate. In terms of power, KWC claims 120 meters per second or 394 feet per second for the 4.5mm Steel BB KWC M11 while the 6mm Airsoft Mac 11 had a claimed fps of 152 mps or 499 fps. During my testing both guns actually shot much faster than claimed with the steel BB M11 shooting 5.1 grain steel 4.5mm BB's at an average of 453 fps. The Airsoft KWC Mac 11 with its lighter .20 gram 6mm plastic Airsoft BB's averaged a very hot 556 fps which is probably going to be too hot for most Airsoft fields but a lot of fun shooting in your back yard! Both the Steel BB and Plastic Airsoft BB KWC M11's have an internal fixed hop-up system which did seem to help out a lot with accuracy. From my semi rested shooting position with paper targets setup 30 feet away, I was able to get well centered 1-5 to 2 inch groupings from both versions of the KWC Mac 11 CO2 Pistols.The Airsoft KWC M11 did shoot a little high and to the right but not a lot while the Steel BB M11 was centered well left to right but again just a little high. 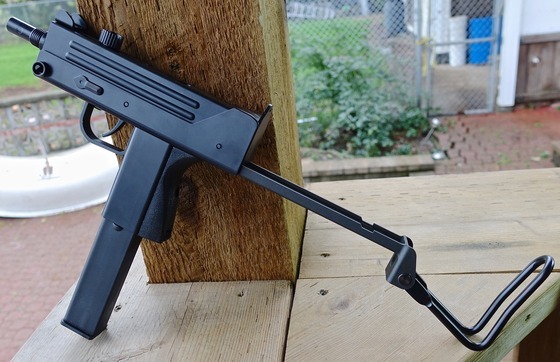 Both KWC Mac 11 M11 CO2 Pistols shoot in double action and have what I would consider to be about medium pull triggers since there are not a lot of moving parts or any type of blowback operation. This means they will be more CO2 efficient and likely to have very few problems since they are very simple in design. If you want a great performing low cost and simple in design Mac 11 Replica then take your pick, 4.5mm Steel BB KWC M11 or 6mm Plastic Airsoft KWC M11!